xperience cycling like never before with the Raleigh Motus Grand Tour; when style meets performance. Designed in Britain and made in Europe, our top of the range Motus uses the latest technology to deliver a premium electric bike experience. The Motus Grand Tour is perfect for a range of city trips, relaxed tours and weekend trails. The reliable, long lasting electric components from market leader Bosch, will provide an exceptional riding experience. The 400WH semi-integrated battery will allow you to ride for up to an impressive 110 miles on a single charge*. The Active Line Plus motor makes its first appearance on a Raleigh electric bike offering an almost completely noise free experience and a higher level of pedal rate detection to improve cycling efficiency so you can get the maximum enjoyment out of your journeys. What’s more, with a maximum assistance output of 270% you’ll find the hills a breeze compared to a regular bike. The sophisticated Intuvia Display offers maximum clarity and convenience with the display screen placed in the centre of the handlebars for easy readability and the control unit is safely on the left handlebar. The gear shift indicator ensures you’re riding in the correct gear to optimise battery consumption to increase your bike’s range and Intuvia can even charge your mobile! 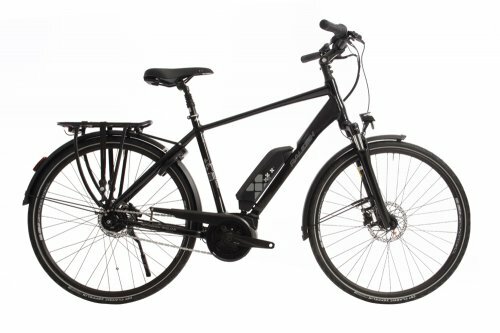 The Motus Grand Tour is a fully equipped bike packed extra features and quality components such as disk brakes for ultimate stopping performance, reflective ebike-specific tyres, a traditional bell, wheel lock for added security, adjustable handlebar stem, suspension saddle and integrated lights. Plus get the added choice between hub or derailleur gearing systems dependant on your requirements. Available in Low Step or Crossbar fame designs, with various size options including a smaller 26” wheel option in either Grey or Black.